Scooters wail through the tangle of alleys, weaving round ladies in conical hats with yokes balanced over their shoulders and old pushbikes half-buried under baskets of fruit and slowly perambulating cyclos. The sound reverberates off the walls of the decaying colonial buildings with their sagging awnings and missing windows and roofs bodged up with corrugated iron. 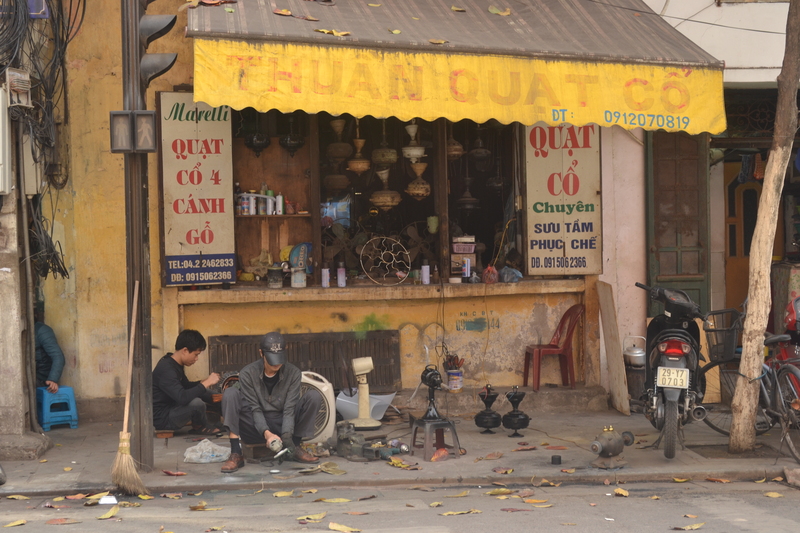 Traders spill out of their shops and fill the pavements with mannequins, fridges, anvils and circular saws. Women sit cross-legged, shaving pigs’ trotters and scaling fish with cleavers; men kneel over sheets of stainless steel, hammering, grinding, welding, drilling, and fashion them into boxes and bins. Street food vendors arrange tight circles of miniature stools on any available corner. There is nowhere to walk but in the road with the scooters. One shop sells nothing but heaters. Next door sells nothing but fans. Three doors further on sells lightbulbs. Two doors beyond that sells adaptors and leads. You go to one side of the road when your scooter needs tyres, to the other when it needs a new seat. And if it needs a new mirror as well, then you nip across town to the French Quarter. 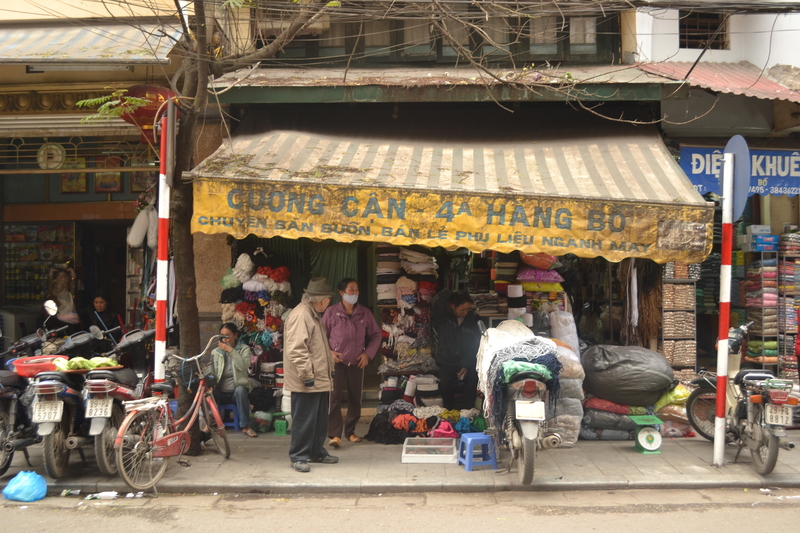 There are two streets on which every shop sells metal boxes, one street reserved for flowers and one for bamboo poles. Padlocks and door handles have half a street each, as have cooking salt and caged birds. Shoes get a crossroads of their own, but trainers, flip-flops and football boots have to share with army surplus. Musical instruments are lumped together with antiques, on the hunch, perhaps, that people who play instruments are likely to collect antiques. 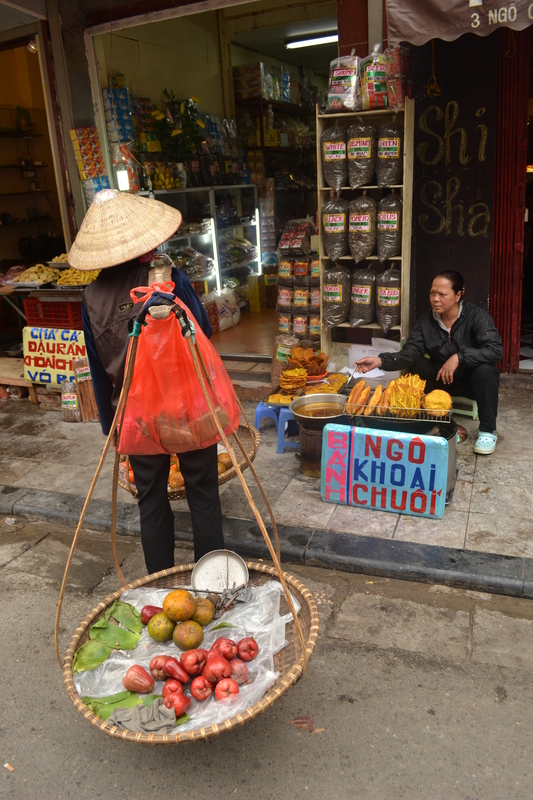 Chả Cá Street is named for the single dish which the restaurants along it sell. The best known is Chả Cá La Vong, so well known that restaurants all over town have ripped off its name. It is a poky little place with a rickety staircase leading up to a room with the look and atmosphere of a rowdy works canteen. Though it is in all the guidebooks and on every food blog, most of the other customers are shirt and tie locals. There is no menu, because chả cá really is all they do. They don’t see the need – as a restaurant would at home – for novelty chả cás or alternatives for people who go to a chả cá restaurant but don’t really care for chả cá. The waiters bring the chả cá in relays. First, a sizzling fondue pot filled with turmeric-stained fish. Then, as that hisses and crackles in the middle of your table, a bowl of rice noodles. Then a ramekin of dipping sauce, a plate of crushed peanuts and a handful of herbs, which the waiter dunks in with the fish to wilt, and leaves you to assemble it when the fish and the herbs are done.